I think we can safely label T-Mo a meddler. 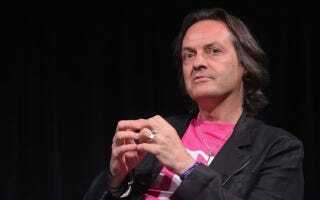 Helmed by the mildly eccentric CEO John Legere, the Uncarrier announced today that it'll offer a free year of unlimited data to current subscribers who successfully coerce a family member or friend from Sprint, AT&T, and Verizon to join T-Mobile. Earlier this week, Sprint put the Framily out of its misery (to cheers from everyone who ever had to watch one of those ridiculous commercials) and launched their newest deals. Problem is, their latest "best deals" are for everyone BUT current Sprint customers who are – once again – left out in the cold.